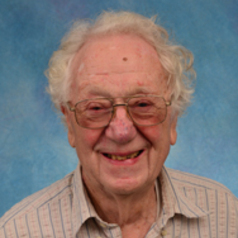 Oliver Smithies, a geneticist and Nobel laureate, was credited with the introduction of starch as a medium for gel electrophoresis in 1955, and the simultaneous discovery, with Mario Capecchi and Martin Evans, of the technique of homologous recombination of transgenic DNA with genomic DNA, a much more reliable method of altering animal genomes than previously used, and the technique behind gene targeting and knockout mice. His research interests included the construction of animal models of complex human genetic diseases to facilitate better studies of their genetics and the resultant pathology and to help develop new modes of treatment, including gene therapy. He was the Weatherspoon Eminent Distinguished Professor at UNC, Chapel Hill. Smithies died on Jan. 10, 2017.